Italy’s Finest World Cup Squads: Who’s #4? The Team: In 1938, Italy would win the World Cup for the second straight time due to its strong roster. Legendary coach Vittorio Pozzo decided to retain only two starters who had won the previous cup, but they were Giuseppe Meazza and Giovanni Ferarri, two Italian soccer legends. These two men would lead Italy to yet another Cup win. 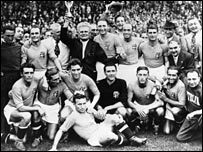 The World Cup was held in France and Italy automatically qualified due to their 1934 title. The squad was composed mostly of youngsters, and the majority of the team played for either Bologna, Roma, Genoa or Juventus. Silvio Piola was one such young player, and he would be the most important piece of Pozzo’s strategy to puzzle opponents. The Tournament: Italy managed to narrowly escape the first round with a nail-biting extra time win over Norway on a miraculous Piola goal. In the quarterfinals, Piola struck twice again to lead the team over France 3-1. In the semifinals, Italy bested Brazil (for once) due to a timely Meazza penalty strike midway through the second half. In the Final, Italy faced off against Hungary, who had demolished their previous opponents. Italy scored first, but Hungary equalized two minutes later. As the game progressed, the Hungarians simply couldn’t stop Silvio Piola, who scored two goals en route to a 4-2 victory. The 1938 team was superb, so I think they belong here at #4 all-time.